Louvre Panel Kit supplied with Rhino Tuff Parts Bins shown above. Bin colour variations also available. An empty wall space can quickly become a useful and versatile storage space with a louvre panel bin kit. The steel louvre panel is galvanised to prevent rusting and produces a high quality, attractive finish. With pre-drilled fixing holes, a user can quickly and easily set up and configure these panels to their exact requirement. Coupled with the industry leading Rhino Tuff parts bins, this louvre panel kit is unbeatable for its durability and value. Rhino Tuff bins are available in 9 different sizes and are all louvre panel compatible. 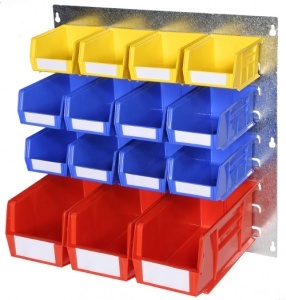 These open-fronted bins can also be stacked and are the ideal solution in maximising your storage or work area. There are 25 different ready to buy kits in the range each with different bin colour options.